Every morning, residents on Grimloch Lane wake up to a new topiary that appears as if by magic. Like all those who live on the street, William wonders who or what is responsible for the beauty and wonder that has come to their neighborhood. One evening, as William was about to head home from a day of celebration with his neighbors, he follows an old man into Grimloch Park. Who is this mysterious man? Is he the one responsible for the magical sculptures that have come to their home? The Night Gardener is one of those rare books that will always feel timeless. It doesn't matter if a reader picks it up in 2016 or 2056. It will always be exciting and relevant to young readers, proving that one doesn't have to go far from home to find wonder and enchantment. Both the illustrations and the text are in perfect simpatico and give off both a gentle and slightly eerie quality that keeps readers turning the pages. 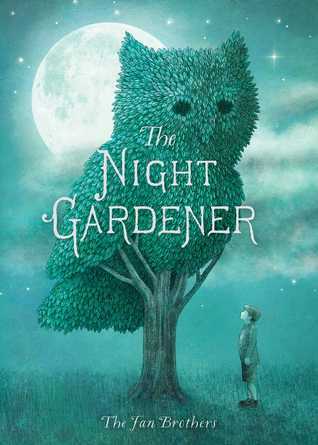 Fans of Lane Smith's Grandpa Green are sure to love The Night Gardener.